During my Yoga Teacher Training weekend, I felt like I needed some comfort food and the first thing that came to mind was fettuccine alfredo. I hadn’t had fettuccine alfredo in about a year or so, and whenever I made it I always used premade sauces. I always felt like the premade sauce was a bit bland and was missing something. I tried once before to make fettuccine alfredo following the recipe from my Magic Bullet – that was a huge, horrifying disaster. This time I felt brave to try making it from scratch! I fought the fettuccine alfredo and I won! I just used the first recipe that I saw online which was from allrecipes.com. It turned out pretty good though I did make some changes. Adapted from AllRecipes.com by ErinMarie. Boil a pot of water and cook your pasta according to the directions. In a large saucepan, saute your garlic in some butter (not the whole 1 cup). (Imelted the butter in the microwave and used some of the liquid to saute the garlic then added the rest of the melted butter to the saucepan). Add the cream to the butter and mix well. Then on medium heat add your cheeses and let it melt. Be mindful to keep stirring so that none of the cheese melts at the bottom of the pan. The cheese will thicken the sauce. If you want to thicken it more, add more cheese and let it stand longer. 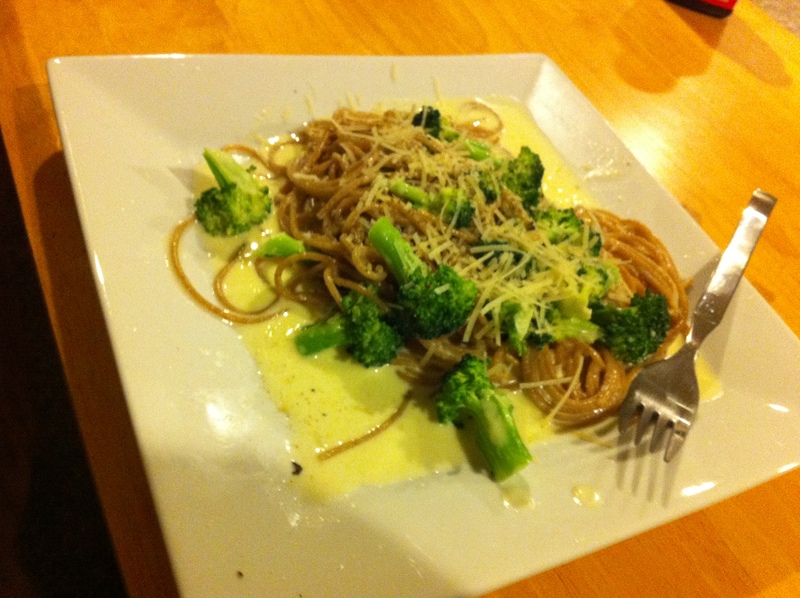 Add the broccoli florets and the pasta, combining well. This fettuccine alfredo was really delicious but it’s probably not something I’ll make again anytime soon due to the amount of calories! The sauce thickened up well and the cheese melted right into it. It was heavenly. I added the broccoli to add some nutrients to this carb and fat heavy meal, but it was definitely what I was looking for at the time (comfort food). We had a lot of left overs which was nice. I enjoy making lots so that there’s lots left to eat during the week! If you’re in the mood for some winter comfort food: this is definitely your pasta! Man this one looks really delicious. I’m glad it came out better than that awful stuff we made two years ago!